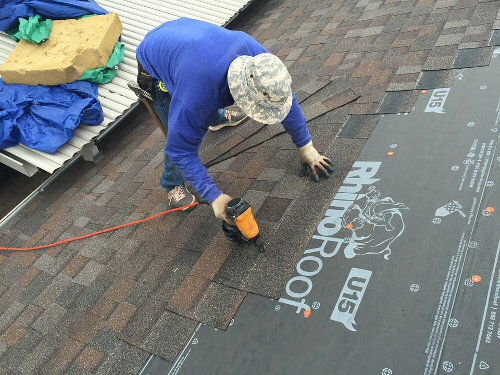 Put your trust in us as one of the best roofing contractors in Richmond, KY. We perform roof repair, replacement and new installs for all of Madison County. We are more than just roofers! As a roofing company we also offer siding replacement, gutter installs, window repair and a variety of other home remodeling projects. We’ve put together some helpful tips on how you can determine if your roof needs repaired. As you can see this water spot on the ceiling is very hard to notice. 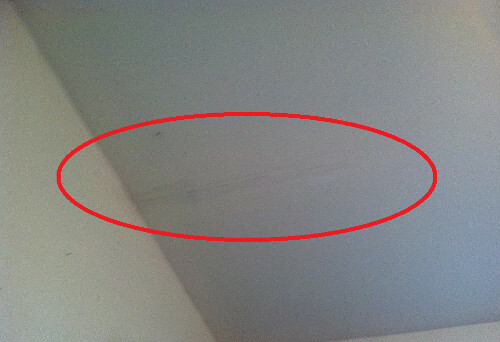 One of the last problem areas to notice, but the easiest to determine are water spots on your ceiling. At first this can be extremely faint and hard to see, but the sooner you find it the less expense you will incur. This is what happens when you delay repairs from a leaking roof. Sometimes issues with your roof can go unnoticed. It’s not until you find these areas on your ceiling that it becomes apparent that you have a problem. Other than an unsightly curb appeal, most homeowners don’t take into consideration that missing shingles are a big deal. 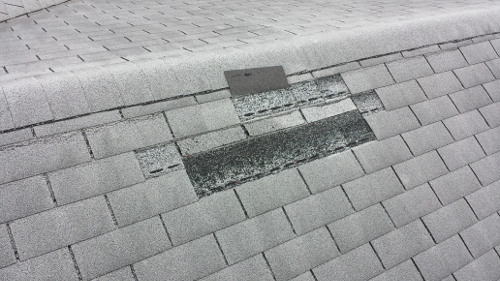 Missing shingles caused by wind damage. If you have noticed that your shingles are loose or completely removed then you may have been a victim of wind damages. 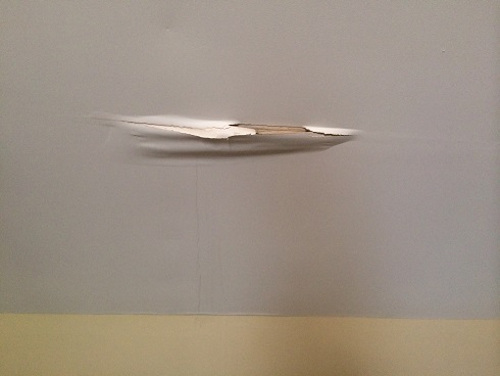 Most homeowners we work with find that these type of damages are covered through filing an insurance claim. 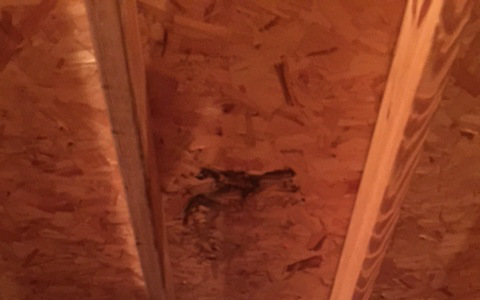 This might be the last place you would consider checking, but an easy way to determine if your roof needs repaired is to check the wooden framework within your attic. This is a roof leaking into the attic. Notice the dark water spot. You should easily be able to spot water damages from a leaking roof by inspecting the rafters within your attic. With so many roofing companies to choose from, we thought we would provide some helpful advice for hiring the best roofers in Richmond. All too often we find that nationwide roofing companies set up shop with locations throughout the US. In the state of Kentucky for example there are many of these outfits that claim to be local, but really only offer an office location with non-vested employees and no owner presence. With our company we are not only locally based, but you’ll have interaction with every staff member including the owner. You’ll immediately feel the difference when you choose us! We are your neighbors and because we only service Central Kentucky, we truly are local. Just about any contractor can install a shingle and hammer a nail, but just how qualified is that? Make sure to ask for the crew’s training certifications and what procedures will be in place when they take on your project. All of our crew goes through continued education and training classes to ensure the best installation methods are being implemented. When we take on your roofing repair, we give you an outline of how your job will be approached. You can expect a quality control concierge to stop in and oversee your entire project. This role is to not only ensure quality, but to answer any and all questions you might have regarding your repair. Another benefit that sets us apart is our owner involvement. Brad Pagel, the owner of our company is committed to staying involved with every aspect of each job we take on. You’ll have a refreshing experience with Brad as he is continuously involved with not only your satisfaction, but also the quality of your installation. Don’t just trust in any review platform. Any roofer can provide testimonials, but it’s your neighbors and local residents you should trust in the most. The following are reviews you can find on our services by local clients that live near you. Our promise is to deliver quality installations and superb customer service as your roofing company in Richmond, KY. Contact us for excellent service and workmanship.